Mack Wilberg is well-known as one of the most revered choral arrangers in the country. His work spans decades, and his tenure leading the Mormon Tabernacle Choir has produced countless recordings of incredible significance to the music community. This album celebrates Wilberg’s strengths as a composer with the premiere recordings of two extended works—The Prodigal and A Cloud of Witnesses—as well as new recordings of five compositions and three arrangements. 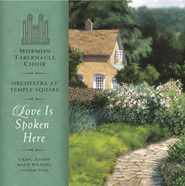 The CD contains 80 minutes of magnificent music from the Choir, the Orchestra, and Mack Wilberg. 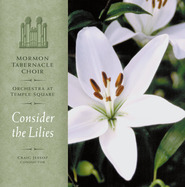 The Orchestra at Temple Square, established in 1999 as a companion ensemble to the Mormon Tabernacle Choir. The Orchestra offers an opportunity for instrumental musicians to also serve as goodwill musical ambassadors for The Church of Jesus Christ of Latter-day Saints as do Choir members. It's been a long time since I've enjoyed a recording from the Mormon Tabernacle Choir as much as this. Although, enjoyed isn't really the correct word. Before I go on though, I will say that not every track is my favorite...some of the songs are dissonant and intense in nature, which doesn't make for easy listening (but they are still masterfully done). Also, on the recording I have, I struggled to understand the words being sung most of the time...I'm not sure if it's a bad CD or just the result of poor enunciation from the choir. However, despite these downsides, the music...I can't say enough about it. The first track and about the last half of the album are purely amazing. I've been listening to it over and over. It touched my soul deeper than I thought possible. Mack Wilberg's compositions are truly a masterpiece.